Shape up for summer if you win our next giveaway, or at least the one I'm helping promote. I'm not the "I" in the text below but that is the giveaway host's words. If you want to win, you have through 6/10 to enter to win. With summer rapidly approaching many of us are panic stricken because we feel that we're not quite ready to brave swimwear. Oh how I long for the days of yore when swimwear covered and camouflaged the entire body, but, alas, that is not the case. My protocol for preparing for the dreaded swimsuit involves the typical diet and exercise. Perhaps I shouldn't use the distasteful word "diet", instead let's say I employ calorie awareness. This is also the time of year I take my Slendertone Ab Belt out of storage, and actually start using it; I suppose it would make sense to use it throughout the year. What can I say, when ya live in the east coast the winters can really wreck havoc on your motivation, as well as sanity. The great minds behind Slendertone have successfully developed EMS technology; electrical muscle stimulation, products that are clinically proven to guarantee results. They were even the first company to receive an FDA clearance. Simply put, the electrical current causes the muscles to contract and then relax, it's this repetition that works those muscles in the way that renders results. Each program is thirty minutes in duration and conveniently timed to automatically end when completed. I encourage all to read my full review which is based on the Slendertone System-Abs Muscle Toning Belt. It's important to keep in mind that the Slendertone Ab Belt is not marketed as a quick fix. Don't expect to go from a beer-gut to a six pack simply by wearing your ab belt. That's not gonna happen. If you have fat to lose, then you will need to diet as well as exercise. The ab belt is not intended to be a miracle worker, but it is an asset to an already good routine. As part of a good routine, the Slendertone Ab Belt is instrumental at toning abdominal muscles, and this will result in a leaner waistline. The Slendertone offers the best price for the product, and even comes with a two year warranty. I've personally found it to be a huge advantage in giving me a leg up in my fitness endeavor. 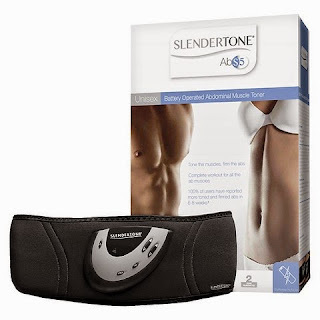 One winner will receive a Slendertone Abs5 Abdominal Muscle Toner valued at $100.00. Use the ridiculously easy entry form below to enter this giveaway. For your tweets to count the MUST be open to the public and not protected. One simple mandatory entry, the rest are there for the very savvy folks that want to increase their odds of winning. Don't forget to scroll down for more giveaways! The bloggers participating in this event did not receive any form of monetary compensation and are not responsible for prize fulfillment. Any questions please email Lisa at msmith572@yahoo.com. Interesting - my daughter was looking into these not long ago, would love to win one for her. I could use some help in the ab department, it would be easy to use and maybe get my summer workout jumpstarted. I could use this for my stomach before summer gets here. I have always wanted to try these things!!!!! I though oh they are a gimmick, but I have read that they are NOT a gimmick. Not a cure all for if you are really lazy and won't move, but they DO work great if you give it your best try at working out a little, too! Leave a thoughtful topic related comment, perhaps something you learned or like about the product. This is a very helpful review. I like that you're clear about what the belt can do. Thanks! I like that Slendertone offers the best price for this product, and comes with a two year warranty. I want to try it....need all the help I can get.